Ethan Schaler, a Clark School senior majoring in mechanical engineering, has won one of only fourteen 2011-12 Churchill Scholarships to the University of Cambridge, in the United Kingdom. The Churchill Scholarship covers tuition and all fees at the University of Cambridge, as well as a living and travel allowance from $16,500-$20,000. Schaler will complete a one-year Master of Philosophy in micro and nanotechnology enterprise before continuing doctoral studies in the U.S. He plans to pursue engineering studies through graduate school and focus his research on developing mobile and networked micro-robots. Schaler is active in the campus chapter of Engineers Without Borders, serving as project manager for five projects in Brazil, Burkina Faso, Ethiopia, Peru and the U.S., while developing a new project in Thailand. He is proficient in Japanese, and has studied abroad and conducted research in Japan on several occasions while at UM. A 4.0 student with numerous publication and presentation credits, Schaler has worked for several years in Prof. Sarah Bergbreiter's lab. 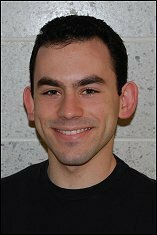 Prof. Santiago Solares also served as a UM recommender for Ethan's Churchill Scholarship application. Schaler has previously won the Goldwater Scholarship and a Bridging Scholarship for study in Japan. The Churchill Scholarship is one of the most prestigious and academically competitive opportunities of its kind, and is the only major scholarship to the UK devoted exclusively to outstanding students in the sciences, mathematics and engineering.